Who was Rumi, and did he really write about tattoos? Now that The Lion Tattoo is soon to hit our shelves, we thought we’d take a moment to explore the background of the tale. Born in what is now Afghanistan in the 13th century, Rumi was a teacher, philosopher, Sufi mystic, and poet. His consistently popular works, originally written in Persian, have been translated into dozens of languages through the centuries, transcending barriers of place and time. One of his best-known poetic works is the Masnavi, which uses a mixture of fables, everyday scenes and religious revelations to encourage the pursuit of truth and growing as a person through love. The Lion Tattoo is one of these fables. A lot of people have asked if the tattoo in our story is a modernisation of the 800-year-old poem. The answer is: no it isn’t! Rumi’s original story really is about someone who wants to get a tattoo. The only thing that illustrator Atefeh Maleki Joo has modernised is the setting. 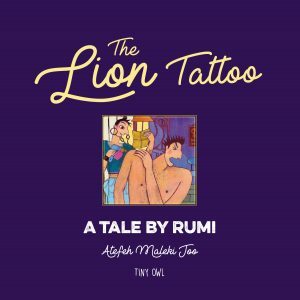 Where Rumi’s fable takes place in a 13th-century barber’s shop, our version of the tale is set in a present-day tattoo parlour. Everything else in the story has survived the test of 800 years. It’s because of the timeless nature and appeal of these stories that we are so keen to bring them to new audiences. There’s a wit to this cautionary tale that’s as warm as it was 800 years ago, and so this 13th-century poet will soon be making his readers smile all over again. Announcing our new witty title for older readers: The Lion Tattoo!